There was a man named Cornelius who was a centurion of the Italian Regiment. Cornelius and his entire household were faithful believers of God. Cornelius loves to give his money generously to the poor and needy and prayed to God. One day, an angel came to visit Cornelius. Cornelius obeyed the angel. He sent two of his servants and a devout soldier to Joppa to Peter. As they were getting near to the place where Peter is living, Peter went up on the roof and prayed. Then he began to feel hungry. Peter fell asleep and he dreamed that a large sheet with its four corners bound was let down from heaven. The large sheet has all kinds of animals that have four legs, creepy crawly, wild animals and birds. This was repeated three times and the large sheet were lifted up into heaven again. Then Peter woke up. While Peter was thinking about what the dream meant, the Holy Spirit said to him, “There are three men looking for you outside.” Peter went down from the roof to downstairs and he saw the men. Peter agreed to go with the men. He welcomed them into the house and spends the night there. The next day, Peter departed with the men to Cornelius. 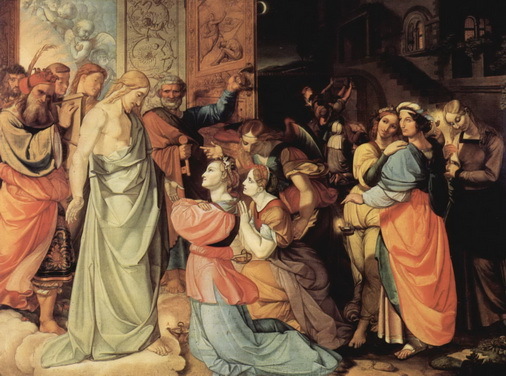 While Cornelius was waiting for Peter to arrive, he had called together his best friends, and relatives. Cornelius explained to Peter,”Four days ago, I saw in a vision an angel told me to sent men to a man named Peter who is living in the house of Simon, the tanner by the sea. The angel told me that when he comes, he will speak the gospel to me.” And so I had sent men to Joppa to you. Then Peter began to preach the gospel to Cornelius and his household. While he was still preaching, the Holy Spirit came and filled everyone at the house and they began to speak the tongue language. Peter said, “Can anyone forbid the Gentiles to be baptized with water for the Gentiles had received the Holy Spirit as we have?” And Peter baptized Cornelius and his whole household. When the apostles at Judea heard that Peter had preached to the Gentiles, they were angry. This is because it is the custom for the Jews not to mix with the Gentiles whom they regard as unclean. When Peter came back, he explained to them the vision God gave him and then they calmed down and praised God. They rejoiced because God had also brought salvation to the Gentiles.